FOIMan makes a confession and sets out his plans for the year ahead. Like many people, today is my first day at work after the festive break. But, as I wrote back in November, the beginning of a new year has even more significance for me in 2014 than in previous years. Many of you have been kind enough to write to me to wish me well in my new venture, for which I am very grateful. Some of you have asked what services I’ll be offering and when these will be available. So I’m going to kick things off this year with a brief outline of what you can expect from me. First of all, a confession. I’m not as prepared as I’d like to be right here and now. When I first envisaged going solo this time last year, I did so in the knowledge that I had a whole year to plan, develop and market my services. The trouble was, of course, that I forgot to consider all those things that I still had to do in that year – go to work, honour existing speaking and writing engagements, decorate two rooms of my house, the housework and occasionally spending time with my friends, family and wonderfully supportive wife. This sense of not being ready is, I am told by friends who’ve trod this path before, entirely normal, so of course I am now anxiety-free (those who know me will recognise this as the massive porky that it is). One of the reasons that I am, at least, less anxious, is that much is in place. I write this post not at my dining room table as with so many of my previous posts, but sat at a desk (in one of those newly decorated rooms, which is now my office). And even more excitingly, there is work in the diary. Most of this will be delivered through Act Now Training, who I’ve now been working with for nearly two years, and have been very encouraging as I enter this new phase of my career. 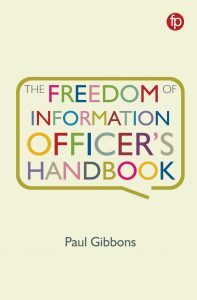 I’ll be continuing to deliver Practical FOI, for those FOI Officers and others who want a course focussed on the “how” of compliance; and the Data Protection A-Z course, which gives an overview of the Data Protection Act. But in addition, I’ll be running new courses on records management (including one focussed on Scottish public authorities), and Practical FOI’s sister course, Practical DP, which will look in more detail than the A-Z course at how organisations can comply with the Data Protection Act. If you’d like to find out more about these courses or want to book a place, do please take a look at the Act Now Training website. It will be a busy year on the conference circuit again. 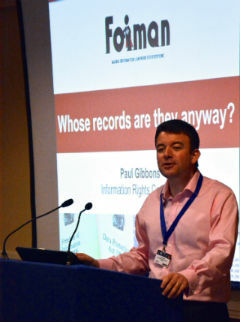 Next month I’ll be chairing a Modernising Government conference on Freedom of Information and transparency, and then in May, delegates at the Information & Records Management Society Conference and at PDP’s Freedom of Information Conference will be able to hear talks from me. Looking further ahead, I’ve been invited to take part in a very exciting project in the Autumn, more of which later. As well as all this, I have a small but growing schedule of in-house training commitments. If you’re interested in me delivering training in freedom of information, data protection or records management in your organisation, please do get in touch (details below). I can offer competitive and affordable rates, and of course, inviting me to train a room full of your colleagues is much more cost effective than sending them all on a similar external course. I’m also available if organisations need advice on matters relating to freedom of information, data protection and records management. In due course I will be advertising more details of this service, but if you want some help in the meantime, please don’t hesitate to get in touch. 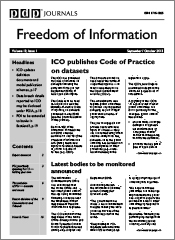 Marking this new phase, FOIMan now has a new strapline: Making Information Law Work For Everyone. This sums up my attitude to information rights. I don’t see a conflict between organisations, including public authorities, knowing how to apply information rights legislation correctly, and members of the public, journalists, and others exercising their rights under the same legislation. So far I’ve talked about services aimed at the first half of that relationship. But I’m very keen to find ways to work with those wanting to make effective use of the Freedom of Information Act in particular. So watch out for more on this as the year goes on, and again, if you have any specific requirements, let me know. I started off this post by confessing that I’m not as prepared as I’d like to be. But it would be pointless to start out with everything established and organised the way I’d like it to be. If I wanted to turn up to work every morning knowing what to expect over the coming year, I wouldn’t have chosen to work for myself. This is the beginning. Things will move very quickly. It’s exciting. So stay with me in 2014 for more on information rights and management, and maybe a little of my adventures in the new world of running a small business. You can paul(Replace this parenthesis with the @ sign)foiman.com?Subject=enquiry or you can call me on 020 8778 2331 (landline) or 07799 654509 (mobile). Good luck Paul, rooting for you from the RM Fence.